In this reviews, we’re going to share our experience about choosing car battery jump starter. We will be taking an informed closer look at some of the best car battery jump starters on the market, and giving you the advice and information you need to choose the right product for your exact vehicle needs. Many of today’s surveys reveal that the top of the list of vehicle-related call outs is dead or flat battery-related problems. Drivers get caught unaware that their car battery has gone flat and usually pay for the neglect. It can be frustrating and embarrassing, to say the least when having to ask passing motorists if they have jumper cables onboard that can provide your car with the needed boost. Whether it’s extreme heat or cold or you simply left the lights on, batteries die for all sorts of reasons. The good news is most of them can be jumped back to life with a car battery jump starter. But many features should be considered before buying a jump starter. Though it seems a little complicated to know which battery booster pack is best for you, we have a solution to help you out. 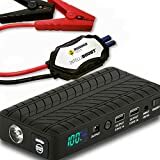 We have reviewed some of the best and most reliable car battery jump starters for you to make the right decision when buying. In our selection, we have taken into account, the performance, reliability, previous track record, and also the capability to jump start your vehicle. We have also taken a good look at the physical features like weight and ease of use of the car battery booster when used on your car or truck. The Stanley J5C09 Jump Starter with Compressor offers a convenient, portable way to jump-start your car battery without the need of another vehicle. All that is needed is to attach the clamps to the battery simply. There is a super little security function built in and activates if the lead clamps are connected improperly, sounding the alarm, alerting you to switch the clamps before turning on the unit. With more than enough power to jump-start your car, motorcycle, truck, boat, RV or even your tractor, the Stanley Battery Jump Starter with Compressor is ideal for everyday use or any roadside emergencies. 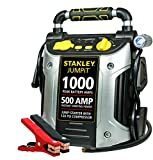 The Stanley J5C09 Jump Starter pack is in our opinion one of the best jump starter packs available. It has 500 amps of instant starting power as well as 1000 peak amps. Think of it as bringing your car back to life! It is so easy to use simply hook the clamps to your battery, turn on the switch and start your vehicle. The Starter has you covered with a USB power port and 12 volt DC outlet, so if the lights go out for any unforeseen reason or you just need to charge your mobile phone, tablet or laptop, you’re ready to go. It’s great having that kind of portable power on the go! Finally, charging your Stanley j5c09 back up after use is just as simple as using it. 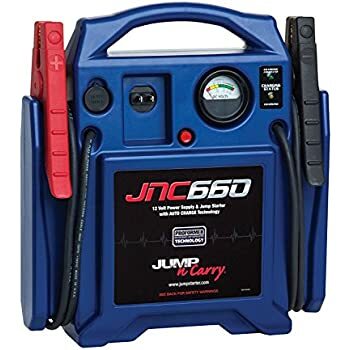 The Jump-N-Carry JNC660 Jump Starter features an automatic recharging system using a built-in charger just connect an extension cord. 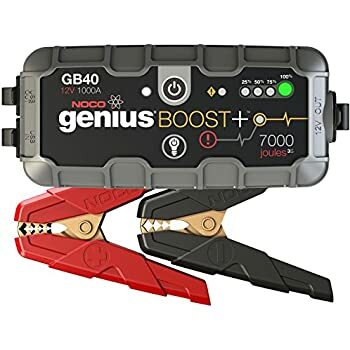 All that is needed is to attach the long lead clamps to the battery simply, and this offers a convenient, portable way to jump-start your car battery without the need of another vehicle. This power pack is more than capable of jump starting your car, truck, motorcycle, boat, or your RV, and is ideal for everyday professional use or any roadside emergencies. 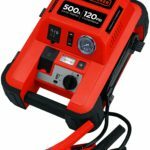 This is the Clore JNC 660 and is our second choice in the category of best portable jump starter packs we have picked out. Now it may not look as fancy as some of the other brands, but this bit of kit will get the job done for you. The pack is easy to use, and thousands of professionals have come to rely on this product every day. The jump and carry 660 delivers 1700 peak amps and 425 cranking amps of starting power with a weight of just 18 lbs. It is perfect for a variety of professional starting environments, including, fleet service, auto dealerships, automotive service, marinas, auto auctions, dealerships, and more. All components in the Jump-N-Carry JNC660 Jump Starter are designed to support the very best delivery of extreme starting power. This includes the power path components. 46″ long, heavy-gauge cables which effectively and efficiently transfer the unit’s power to your vehicle, while heavy-duty clamps penetrate battery corrosion. The Powerall PBJS Portable Power Bank features a battery charger, a car jump starter, and a LED flashlight. All of them combine into one compact design that is Powerall PBJS. It can easily fit in your pocket. The Powerall PBJS Portable Power Bank equipped with two 5 Volt USB ports that can charge two separate devices simultaneously. It also has sleep mode feature. It goes into sleep mode once it is fully charged. This power pack is more than just a great jump starter the portable PowerAll power bank can charge all of your portable electronic devices, such as smartphones, tablets, cameras, camcorders, GPS unit, MP3 players, wireless headphones, and portable gaming systems. So, anywhere anytime, you can easily charge your electronic devices such as mobile, cameras, GPS unit, MP3 players, wireless headphones, car battery, etc. 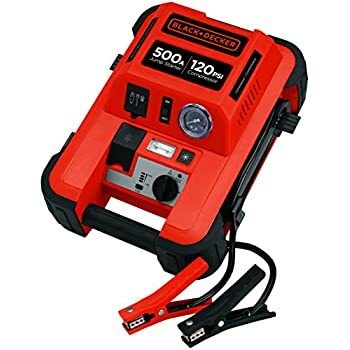 The Black And Decker 500, Amp Jump starter, have a built-in Air Compressor and many charging outlets. This jump starter can start almost any gasoline car and is on sale right now. If you have ever owned any vehicle with an engine, then you have probably had at least one experience with a dead battery and waiting for someone to arrive and give you a jump start. It usually only takes this happening once before most people will consider buying a 500 Amp Jump Starter, so they are no longer in a position of being stranded. A 500 Amp Jump Starter can provide the cold cranking amps required by most cars and smaller trucks or marine vehicles to get them going again. 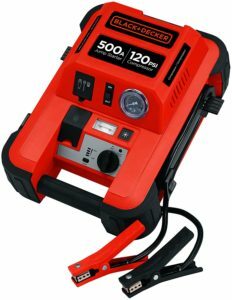 Depending on the make and model of the jump starter you buy, there may be other things the 500 Amp Jump Starter is capable of doing for you as well. Some features are standard on all 500 Amp Jump Starter models and others are available only on special models. 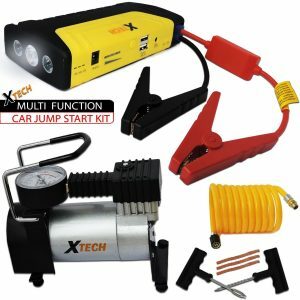 Standard features on the jump starter include jumper cable and clamp attachments, a reverse polarity prevention system and a charger indicator. On lower-end models, the charger indicator will most likely only be a LED that will light up when the charge is complete. On higher-end 500 Amp Jump Starter models, the charger indicator will be more precise using a needle gauge or series of LED lights to mark the charging process, and many will also automatically cease charging once the battery is full to prevent damage from overcharging. 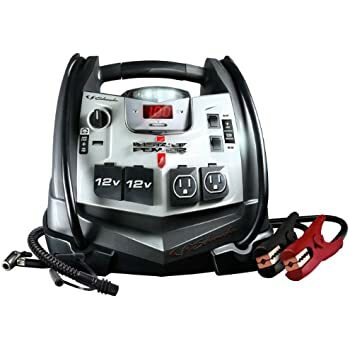 Other optional features that may be found on 500 Amp Jump Starter models include AC/DC charge outlets to allow you to charge/run small electronic devices such as cell phones and emergency radios as well as powered air inflators for tires. Some 500 Amp Jump Starter models also come equipped with emergency beacons and weather radios as well. 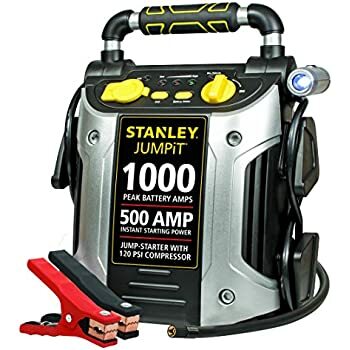 You can also buy different styles of 500 Amp Jump Starter models. This item BLACK+DECKER JUS500IB …. 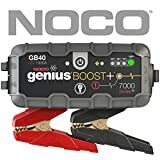 NOCO Genius Boost Plus …. Schumacher XP2260 1200 Peak Amp…. 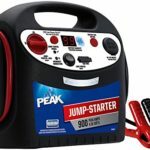 The Peak Jump Starter 900-Amp is on the top of my list for best jump starters. It is a complete package, packed with everything you could need for your car. It has several great features that you don’t find in all portable jump starters. Designed by Peak, the company that makes a lot of other products for your car from batteries to anti-freeze, you know this is a quality product, from a car enthused company. It has a beautiful compact design, with easy carrying handle, heavy duty jumper cables that stow neatly into the side of the case, and covers for the DC outlets. If you have ever been stranded after work coming out with a dead battery, you know how aggravating it is. Especially when all you want to do is go home, and not have to wait for a costly tow truck. Even if you have AAA, waiting, sometimes several hours can put you in a bad mood, especially if you have something important to go to or pick up your children. Having this jump starter in your trunk will cost you at most 5-10 minutes. I’ve personally been late to work, due to my car battery getting old. When the temperature drops at night, then the next morning I come out, the engine cranks, but not enough to start the car, and I am late for work. Of course, it was before I owned a jump starter, now if I have that problem again, I will be on the road within a few minutes. This jump starter can start almost all gasoline cars and trucks and even 4 and 6 cylinder diesel. It has enough power, and you don’t need to worry about it not being strong enough, unlike with the lower amperage, cheaper jump starters. Companies that will stand up for their products are great to buy from because they truly care about their customers. 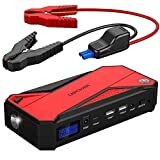 I would recommend the Peak jump starter 900 to you, if you need more than just a jump starter and want something that has all these extra capabilities. A jump start, also known as a boost, is a fairly straightforward method of starting a vehicle with a discharged or dead battery. A temporary connection is made from the discharged vehicles battery to the battery of the other vehicle, or to some other external power source. Once the vehicle has been started, its normal charging system will recharge so that the auxiliary source can be removed. Motorists may carry jumper cables or a portable jump starter in case of accidental discharge of the battery (for example, by headlights or ignition switch left on while the engine is not running). This is a subject near and dear to my heart. I can’t tell you how handy these little portable emergency jump start kits are. From not getting stranded to needing a quick emergency light, they are tucked away in the trunk, ready for action when you need them. When I lived up north, more than once did mother nature thwart my car starting process. 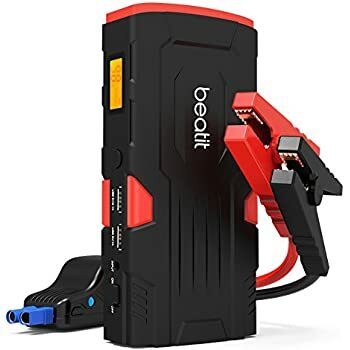 These little car jump starters have an incredible amount of starting power and can bring the most stubborn battery to life and get your car started when you need it most. When your car battery voltage gets low, you will thank your lucky stars that you were prepared. The time it takes to jumpstart a car is literally a few moments. The alternative is expensive tow trucks, stress and long periods of waiting, often late at night in the middle of nowhere or a part of town that you wished you weren’t in. Now that I live in the sunny south, rest stops are often few and far between so having the emergency light when I needed it has proven invaluable. As your car battery life diminishes, it becomes more and more necessary to be prepared. Once I was stranded without my battery plus unit, and it turned a simple repair into an all night, very stressful event. I will never go anywhere in my car without one of these included. The low cost, high safety, and ultra convenience make it a necessity for my car. A dead battery can ruin your day if you are not prepared. Portable Emergency Jump Starter Emergency Kits come in many flavors. These invaluable accessories allow you to jump start a car or truck when you need it most. Many models also offer built in flash lights, radio for emergencies, air compressors for a low tire and meters to show charge levels. They all are well laid out and are easy as can be to operate. You will greatly appreciate their ease of use and convenience when you are tired and frustrated out on a dark, lonely road and just want to get home. These Portable Jump Starter Emergency Kits charge by either plugging them into a wall socket or using the battery itself in your car to charge them up. If you are in a cold climate, consider one of the more powerful models as they will be a lifesaver on cold days when you need to jumpstart a car. Many models offer the advantage of charging a car battery as well. Low-cost features that will save you a bundle of cash if you would have had to call a tow truck or go to a service station. The basic models get the job done. They don’t offer all the bells and whistles of the more advanced models, but they are rock solid reliable in getting your battery jump started. When jump starting a car, the process couldn’t be easier. Attach the red lead to the plus “+” terminal of the battery, and the black lead to the minus “-” terminal. These models are a little more advanced battery jump start technology in that they offer other features and more boosting power to your battery. Lights and air compressors are some of the most popular and sought after features that they offer. Make Your Life Easier and don’t get your clothes dirty! A must have accessory when you are out on the road, and your car breaks down are gloves to protect your hands and nails. These are a life saver as they keep you from getting grease on your hands and also protect from scratches and abrasions. These Battery Portable Jump Starter Emergency Kits offer the ultimate in both safety and convenience. These advanced, easy to use models offer the highest capacities of any chargers, which means that they have more power available when you need it for jumping your battery, inflating your tires or just simply running the flashlight out on a dark highway. Juice is a term that refers to the battery acid, and this acid holds a charge which is a necessary factor in a car battery. When the battery reaches this lower level and does not have enough juice to start your car, then there are as well several ways to boost or charge car batteries. When a battery is not operating properly, a car will try to a turnover on occasion but will not fire. If the battery is completely dead, the vehicle will not turn over and lights or other instruments will not come on or will come on but will be very weak or dim. In such an instance, it is necessary to jump-start the battery or to charge it to start the vehicle. The fastest way to start a vehicle once the battery has lost charge or died is to hook your battery to the battery of another vehicle and to jump start the car. Cables that are used to jump start a vehicle are easily available and can be found in most any store that will sell automotive items. You will want to be able to get the cars as close as possible because most jump start cables are on average approximately 6 feet long, although you can buy different lengths. Once the cars are positioned, then you will hook up the cables as indicated, black for negative and red for positive. The other vehicle will need to be running to supply full cranking amps, and your vehicle should start easily. A car battery charger can be an effective way to charge a car battery to keep its power in operating condition. Several chargers will offer several settings, and one can let their charger deliver a “trickle” of power on a lower setting, and this setting is good if you want to leave the charger hooked up for long periods, such as overnight. Other settings will charge the battery faster, and some chargers will host a boost setting which delivers a strong charge that can instantly jump start the car if the battery power is low. A car battery booster is used to deliver high amps to jump-start a vehicle and can be used in several conditions. Boosters will most like need to be plugged into an electrical current to supply the power necessary to turn over the engine and power the battery. Having a durable extension cord will most likely be necessary unless a power source is easily accessible and close to the vehicle. When using an extension chord, it will be necessary to ensure the chord can handle some amps and voltage that the booster is using, or the extension chord can burn, melt and cause a fire. Old Battery: Batteries over time will lose their power or have less charge. There are higher grades of batteries that carry lifetime guarantees for the life of a vehicle. All batteries are subject to wear and tear, and car battery prices will depend on the durability of a battery. The less strain a battery endures will increase its longevity. Dead Battery: A battery can lose power or juice because of several different factors. Batteries can be drained when lights are left on in or outside of a vehicle when it is not running. The battery will provide power to lights and other operating systems such as stereos and or laptops. After time varying on the strength of a battery, it will begin to lose power if the vehicle is not started periodically to recharge the batteries power. Cold Temperatures: A perfectly new battery can still not start if the temperature conditions are too low. A battery has a rating of cold cranking amps and will be stated on the label of the battery. A battery can have a better cranking capability for those that may live in colder climates. If one would find themselves traveling to colder regions, they may want to inspect their batteries rated cold cranking amps to ensure there will be no surprises during traveling. Some weaker cranking amp rated batteries may not turn the engine over even when jump starting a car in cold conditions. Mechanical Failure: Vehicles have mechanical features that can pull a battery charge if they are not operating properly. An alternator that is close to mechanical failure will draw battery power when the vehicle is not running. This causes your battery to be drained and in effect cannot turn over the engine with enough rpms unless a car battery booster is used. Loose or corroded battery and electrical connections can also cause a battery to not keep a steady current and can affect the starting power of a battery.
. Batteries can also explode under extreme conditions, and care and safety need to be used. Ar batteries that are older or have been drained several times may become impossible to charge or boost and it may be necessary to replace the battery with a new or recycled battery. Car battery rates will vary depending on the type of battery and the manufacturer. Cheaper batteries will supply efficient charge but may not last very long and will not have cold cranking capabilities. Lifetime rated batteries are very durable and will offer a stronger cold cranking capability and are designed to last the lifetime of a vehicle under normal operating conditions. Returning the old battery when purchasing a new one will also save money because you can receive what is considered a core charge for the old battery. Old batteries can be recycled and used again and should never be thrown away because of harmful chemicals, such as the battery acid that is used in batteries. Car battery prices can vary greatly due to several reasons. Some batteries are made to be more durable and will often have higher prices than less effective or cheaply made batteries. Cheap batteries may have one jump starting a car often. Types of batteries will effect pricing as well as stores or automotive parts retailers that will offer variations in pricing or host deals and specials on certain store items or purchases. Getting the best battery for the best price does not always determine that the cheapest battery is the best purchase. Several variations for battery pricing are determined and some useful tips can enable one to make the smartest and best battery purchase. A car battery will have a date that as been stamped on the label and will tell you when a car batter will need to be replaced or checked. It is most efficient to replace the battery when necessary and being prepared can save one a lot of money. Car battery prices can fluctuate during certain times of the year according to seasonal weather. In colder regions once the temperatures start dropping, battery prices can increase significantly. It is one time of year when battery purchases are very high due to colder weather causing batteries to not array enough cranking amps. If you are aware that your battery will need to be replaced soon then it is possible to purchase the battery during a season when the prices are cheaper or when certain retailers may be having a sale. Saving this way on car battery prices can be effective. One can effectively use a car battery charger to lenghten the life of a battery. Do not purchase the battery to soon though because batteries when not in operation can lose charge and may not be operable later with out recharging the battery first. In addition, if the battery is not rated with a low enough cold cranking amp standard the battery although new will not perform in colder climates. Purchasing the correct battery for a given area or standard can be very effective and cause one to not need to purchase another battery for several years. Batteries and pricing will be determined by the durability and features of a battery. Car battery prices that are much cheaper can be because the batteries may not perform efficiently for longer periods. Buying a durable lifetime guaranteed battery can be more expensive at the time of purchase but will carry a warranty in case of defect that the battery will be replaced for free. It can also keep one from needing to use a car battery booster in certain situations. Buying a longer lasting more durable battery can effectively save money and time. In the circumstance that a cheaper battery is purchased one may find that due to their conditions that they are replacing the battery yearly when for only a few dollars more they may have been able to purchase a battery with a lifetime guarantee for 5 to 10 years. In the instance you find that the batteries you purchase do not last very long then it may be accounted that car battery prices that are higher based on better performance will actually save a consumer more money. When purchasing a new battery it is also cost effective to save money by giving your old battery to the company or store in where you are purchasing the new battery. The automotive parts stores will accept used batteries and will either pay the customer a core charge for the battery or apply the savings to the car battery prices during the sale. Have you ever thought about what makes a car battery function its magic? It’s 1 of those issues we take for granted, we just get into the automobile and go, and when it passes away we ask why my car battery is dead? Read beneath for some fundamental info as to what adopts the battery construction and how it relates to our vehicles. Car battery produces an electrical charge utilizing a chemical reaction inside the battery. This specific electrical power is utilized to be able to power the starter that starts the vehicles motor and also powers all the accessories within the automobile. Inside the battery are positive and negative lead plates which interact with an electrolyte. This reaction causes the actual electrons to move from 1 plate to an additive which causes the voltage. The actual electrolyte is a mix of water also as sulfuric acid. When the battery is charged this specific water and the sulfuric acid mixture is 65% water and 35% acidity. A dead automobile battery is among the most typical issues drivers face. You’re running late to the office, an appointment or to drop the children off to school and tragically, your automobile will not start. When this occurs, there’s possibility that your batteries are dead or in a losing charge. There are lots of factors and cause why this occurs. *Drainage — Something was left on it whilst the automobile was away. For instance, the headlights, interior lights, air conditioning or the stereo is left on whilst the car isn’t operating. Among the most typical is leaving the automobile headlights on whilst the automobile is parked. This may trigger the batteries to empty. You are able to stop this just by making certain everything is turned off when the car isn’t operating. *Alternator — The alternator continuously charges the battery whilst you drive. If the alternator is defective, then it doesn’t correctly replace the charge for your battery and your battery consequently slowly drains via use till it’s totally out of charge. *Temperature — Extreme hot or cold temps can totally ruin your battery. In truly hot temperatures more than 100 degrees Fahrenheit, the automobile battery drains much more rapidly simply because the extreme heat causes the battery to expend power at a quicker rate. In extremely cold temperatures, the motor oil thickens and makes it much more tough for the battery to start your engine. The cold temperature slows down the chemical reactions required to make an automobile start. *Old battery — The lifetime of a automobile battery is about 4 to six years. Because the battery age range, the inner plates get coated and affected by sulfation. As soon as this happens, the battery no longer holds its charge so long as it use to and ultimately loses all charge. Occasionally your automobile will provide you with hints that the automobile battery is starting to wear down. For instance, your personal keyless entry might quit operating, your personal power windows might edge or your headlights might be soft than usual. 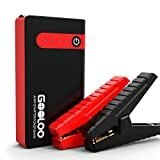 Numerous occasions, although, you’ll not get any hints at all, consequently usually be ready by carrying a transportable automobile battery charger, jumper wires and membership in an automobile club or road aspect help.